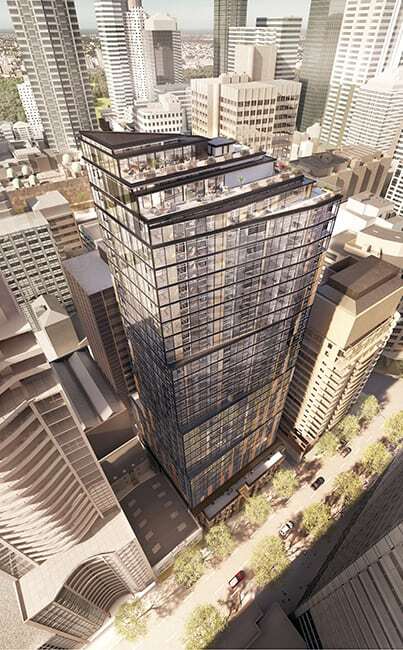 Meriton Suites Sussex Street is the newest offering in our collection of luxury apartment-style hotel accommodation. Opening August 2019, our brand new location boasts the jaw-dropping hotel views, oversized suites, gourmet kitchens, designer bathrooms and five-star service we are renowned for. Perfectly positioned in the heart of Sydney’s CBD and moments away from iconic tourist attractions and corporate offices, whether you’re staying for work or play, you’ll have everything need on your doorstep. Each one of our 301 suites has been created to offer a superior level of luxury. Contemporary and stylish, they feature a fully-equipped kitchen, internal laundry, large bedrooms, spacious living areas and full private bathrooms. And of course, they are fully stocked with designer bathroom amenities. Constructed to be up to three times larger than a typical hotel room, and with the two and three bedroom suites equipped with a second full bathroom, they are perfect for the whole family or group of friends travelling together. Spoil yourself and your nearest and dearest with one of our Exclusive Penthouse Collection Suites. Positioned on the top level they offer unparalleled views of stunning Sydney. Exclusive to our luxury Penthouse Collection, Meriton Suites offers a handpicked assortment of luxury amenities, daily turndown service, and Professional GHD hair straightener. A Nespresso Creatista coffee machine will ensure you wake up to the rich aroma of freshly brewed coffee at the touch of a button in your own room. Every space of the hotel offers complimentary Wi-Fi so you can stay connected to home, or get on top of your work emails or daily tasks. Or unwind in your room after a busy day with a range of Foxtel sports, movies, and television shows. Maintain your fitness routine with our 24 hours fitness centre. Or relax in our resort-style facilities like our indoor pool, spa and sauna. Sydney’s famous Darling Harbour is only a short stroll away from us, offering a wealth of entertainment, cafes and world-class dining options. Or the newly developed Barangaroo Reserve is in close proximity to the hotel and features walking and cycling trails alongside Sydney’s spectacular foreshore. Perfect for a morning or evening stroll, when Sydney shines the most. Our Sussex street hotel is surrounded by some of Sydney’s most popular tourist attractions and iconic landmarks. A stay with us is the perfect option to immerse yourself in the culture and excitement of Sydney City. And our exceptional team and our five-star facilities guarantee a luxurious and comfortable experience that’ll be remembered for a lifetime. Please note: We are taking reservations for this hotel for arrivals after the 1st of August 2019 onwards.